Don’t want to look too girly? You have to opt for more masculine shapes. Don’t worry, you won’t be looking like a man! Oversized jackets make a perfect combination, offering some well wanted space around the body and if you throw them over your shoulders, voila – an effortless good and modern look. 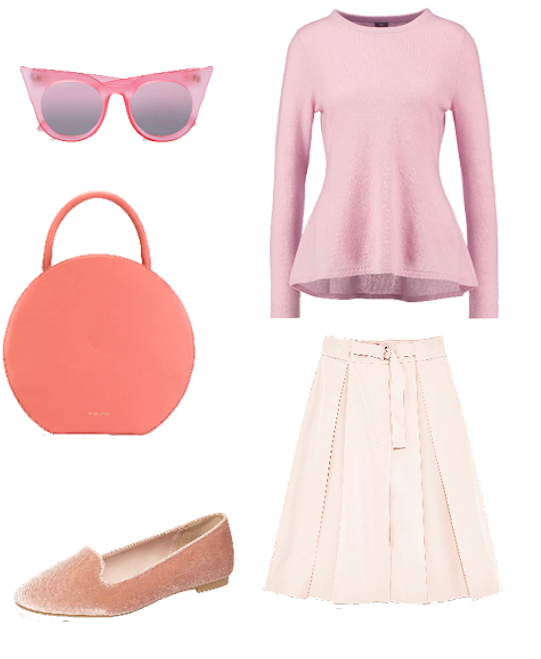 Culottes will show enough ankle to offset the heavier top half and moderate the sentimentality of pink. If you don’t quite like the idea of wearing gingham culottes, try a breezy white linen one. 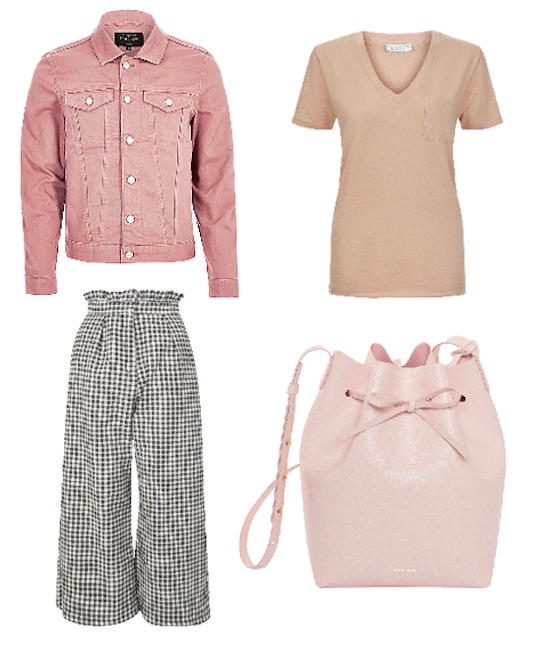 A pale pink bag will complete the look. 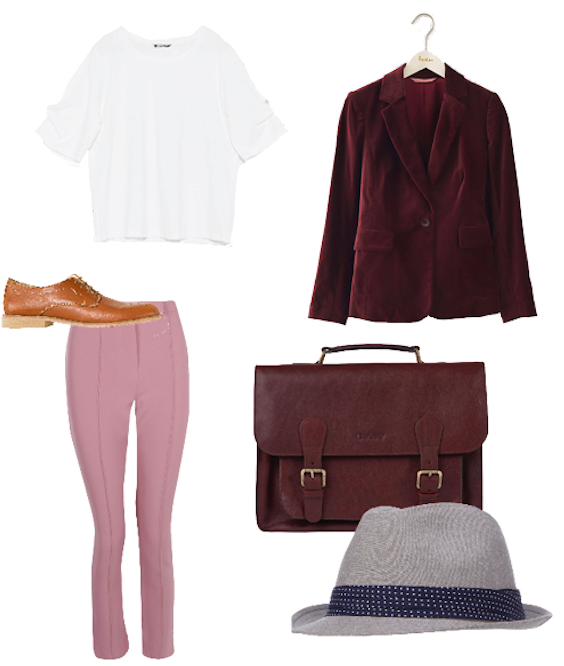 Burgundy and pink are best friends together if you want to wear a more mature outfit, wether you’re using them to work in the office or to else. But to complete the outfit, you probably will need the company of the good old humble cotton shirt, brogues and a fancy hat, that will complement your cigarette trouser. 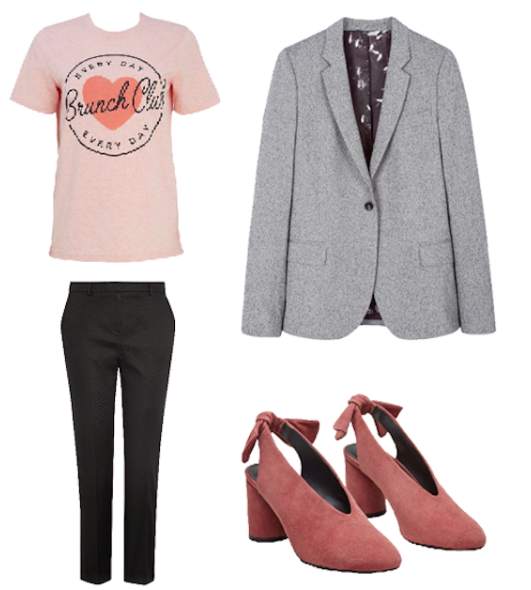 Simple yet sophisticated – Basic T-shirt, black trousers and coat! But bearing in mind that it’s all about the details. Of course we want a bit of feminine touch. But the star of the show, in my opinion, is the pair of shoes – don’t they look just so luxurious? Adding on top that it’s made of suede, which translates as something even more special. If you don’t like the idea of wearing heels, try a pink taupe trainers instead, adding a sporty touch. One part pink to every part red and there you go – no pattern or print needed here. Low mules offer a more practical alternative to stilettos and are a great wardrobe investment if you’re new to experimenting with colour. 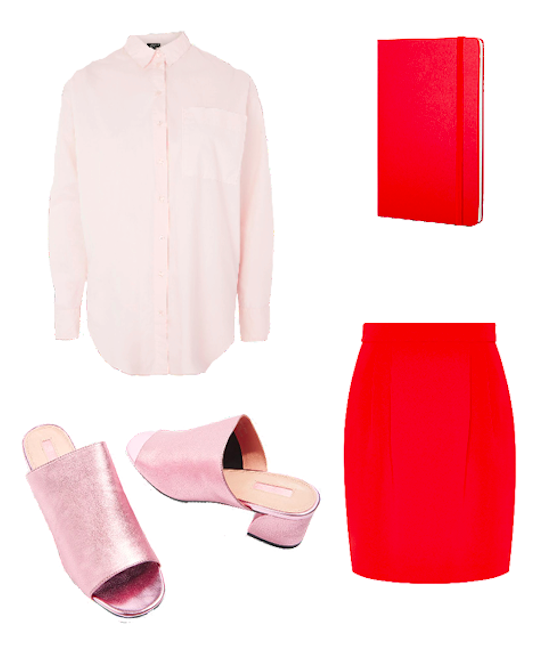 Pair it with a pink lipstick and the outfit comes together brilliantly. If you are planning to go to a wedding or summer event, this is one bold statement that you should be wearing. A full blush gown would make a punch for a formal event, but separates can often be a better investment, mixing and matching depending on how brave you are feeling that day. Not forgetting to add a well-applied blush or pink manicure and this can make this style look deliberate. What do you wear for work? Or what would you wear when going to a wedding?